You just have to pay attention. If you don’t, you’ll miss them, or see something else — something you expected to see rather than what was really there. Faerie voices become just the wind, a bodach … scurrying across the street becomes just a piece of litter caught in the backwash of a bus. COATICOOK — We named our daughter for Jilly Coppercorn. The literary Jilly as imagined by Ottawa author Charles de Lint came from a place of sadness and magic, our Jilly from a place of hope and wishes. They both love the creation of art, are cheerful and chatty, don’t like change, can see things the rest of us can’t, and collect and retell stories ripe with magic. When curious things happen to and around them — and curious things always do — they handle it earnestly. Most importantly, they share a near-unwavering belief in the theory of consensual reality, that if we agree it is true, then it is true. It was under this cloak of Jilly’s belief and my cynicism that we arrived at Foresta Lumina. Now, don’t get me wrong. I believe in fairies. Absolutely and completely. But I had it in mind that the experience we were about to embark on was little more than a cash grab with a pretty story behind it. Once through the park gates, it took me a little bit to give in to the magic that is Foresta Lumina, but when we turned a corner and a hillside came alive with elfin light and the telltale tinkle of otherworldly conversation, I bought in. The park’s multimedia light show is a collaboration between locals who have always known about the magic of this space and Quebec-based Moment Factory, which helped bring their visions to life. 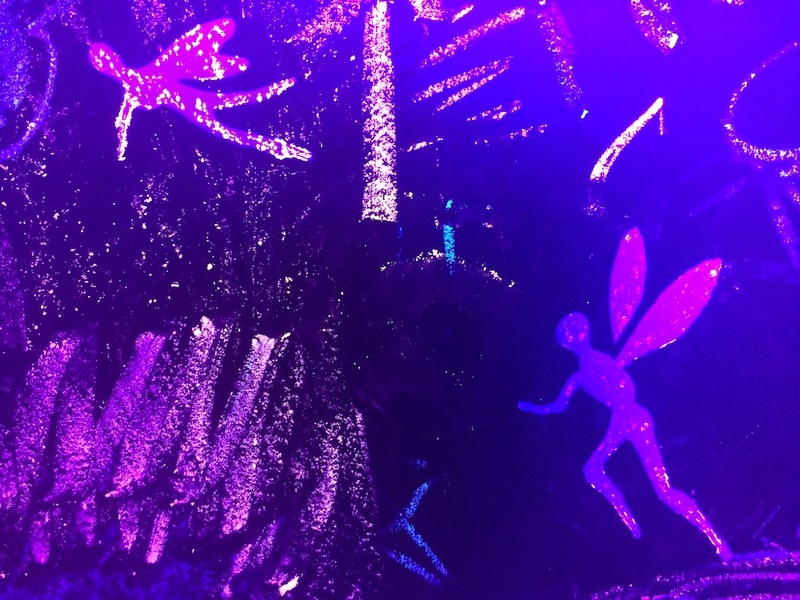 Using light, holograms and projections, Moment Factory guides visitors over 2.6 kilometres of nighttime trails, telling the story of Margaret, a Coaticook girl who can see through the veil to fairyland. We followed Margaret’s trail to discover fairies, portals, the Creature, the Tree and other immortals. We were by turns mystified and terrified. We crossed the longest suspended footbridge in North America — it is so dark we couldn’t see the bottom of the gorge, but were drawn to the pinpoints of light that are part of the story. We walked through fog and past fires, marveled at the Tree, and then turned a corner at the bottom of a steep hill and — it became impossible to tell where the pixies ended and the stars began. The gorge was overflowing with multicoloured light sprayed against the trees and rocks, wavering on the inukshuks and in the water. It was incredible and overwhelming and impossible to describe. We returned the next day. The entrance to the park was unseasonably warm yet it was cool in the gorge. We walked the same trail and pointed out each of the fairies’ hiding places. We peeked into the woods where the Creature had terrorized us and tried to find the Tree. The inukshuks were as awesome as they had been under a million fey lights and from the top of the suspension bridge we paused to marvel at the valley, bursting with barely contained magic. Foresta Lumina runs on Fridays and Saturdays till mid-October. The 2.6-kilometre trails takes about two hours to walk if you take the time to enjoy each piece of the story being told. About 200 ticket-holders are allowed in every half hour, but there are very few bottlenecks and visitors can take as much time as they need. The site is not accessible. Tickets range from $10-$16 and include entry to the park during the daytime, too. Reservations are very strongly suggested. We encourage you to go back the next day to seek out each little niche and stone that hid sprites the night before. Parc de la Gorge de Coaticook — which gets three out of a completely arbitrary five sneakers from us — is open year-round. $2-$6 without Foresta Lumina, and there are additional fees for various activities. Check the website for details and to purchase tickets in advance. This is part of an occasional series exploring North America’s national, provincial and state parks. Next I can’t see a damn thing. Is it fog or is it mist?